This was a very fun concert as I was dividing my time between listening to her wonderful music and sitting on the steps of the stage taking photos. Her set included “Open Your Eyes”, a magnificent reading of “Afro Blue”, and the soul-stirring “Walk With Me.” Her rendition of “Nature Boy” has become a favorite of mine. Carlos opened the song with nice bass solo, Deanna jammed on the Rhodes, Mark came in on the drums, and Lizz just brought out all together beautifully. She soared on “Eagle & Me” and the wind rose at the Wright moment when she sang “Eternity” and “Blue Rose.” Her voice had a way of summoning a cool breeze on a hot August afternoon. She was gracious, shy, and beautiful as always. Each time I see her in concert, she seems freer in her music as walks further in the light. Every lyric has a new meaning as she brought a hush over the crowd as she sung “Home.” “Salt” had some new seasoning and “Silence” was reverent. Just when we thought it was the end of her set, she came back and sang “Lead The Way” and “Fire.” She also included “Nothing Will Be As It Was,” a Milton Nascimento composition. Hot music on a hot summer day! Have you gotten the new Lizz Wright album, Dreaming Wide Awake, yet? It is wonderful and I promise to share my thoughts soon. Lizz will playing at The Independent in SF on Tuesday, August 16. Verve Records is running a contest on her website, www.lizzwright.net, to win tickets to this event. This entry was posted on Thursday, June 23rd, 2005 at 2:39 pm. 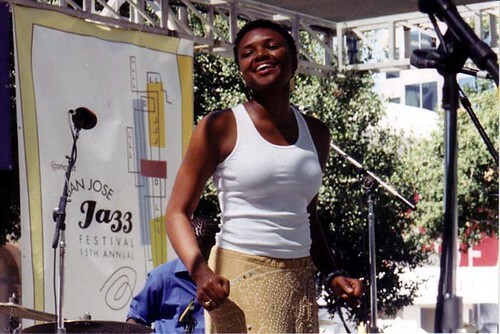 It is filed under Lizz Wright, San Jose Jazz Festival and tagged with 2004, Carlos Henderson, Deanna Witkowski, Lizz Wright, Main Stage, Mark Collenberg, San Jose Jazz Festival. You can follow any responses to this entry through the RSS 2.0 feed. Thanks for checking out our blog! I LOVE Lizz Wright! Cool blog!